The Krone Experiment and its long-awaited sequel, Krone Ascending, by J. Craig Wheeler are both now available in all e-book reader formats! Check out the Krone webstore and download them today! 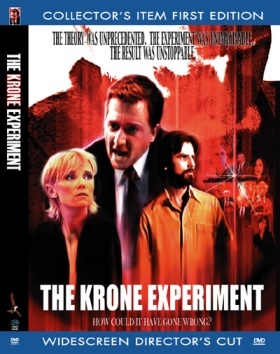 Originally a science fiction novel written by J. Craig Wheeler, The Krone Experiment has been adapted for the screen by his son, J. Robinson Wheeler, and producer Benjamin Pascoe. The movie is the result of the collaborative effort of dozens of talented actors and crew in the Austin, Texas film community. It's the movie that speculated the results of the Large Hadron Collider experiment years before it became a headline-grabbing reality! The Krone Experiment — a brilliant speculative thriller, a labor of love and family, and definitely the greatest "home movie" of all time! I thought I could buy the DVD here? The first edition DVD is now out of print and no longer available through this website. Look for a digital download version sometime soon. Is the original novel still available? The original hardcover is out of print and no longer available. The e-book edition of the original novel and its sequel are now available for all e-reader formats! Download and enjoy! Did I hear you were doing a sequel? "Krone 2" was conceived as a limited series of webisodes -- a way of telling more of the story over the course of several short episodes. We pick up on the lives of the characters, where they are now, and drop hints about the events of the sequel, "Krone Ascending," which is also published for the first time as an e-book. Coming soon! What does "microbudget" really mean?" Less than ten thousand dollars. Most feature films, even independent films with what's considered a low budget, cost roughly $15 million to $20 million dollars. At the next smaller level, $150,000 is what some people spend to make their first indie feature. Take that another factor of ten, $15,000, and you have what some people spend to make a short film. Now expand it back from a short film to a full feature film with dozens of locations and a large cast, based on a popular novel. That's the microbudget level, and that's The Krone Experiment. Last updated: Saturday, 26 September 2015. The Krone Experiment Web Site is Copyright © J. Robinson Wheeler. All rights reserved.